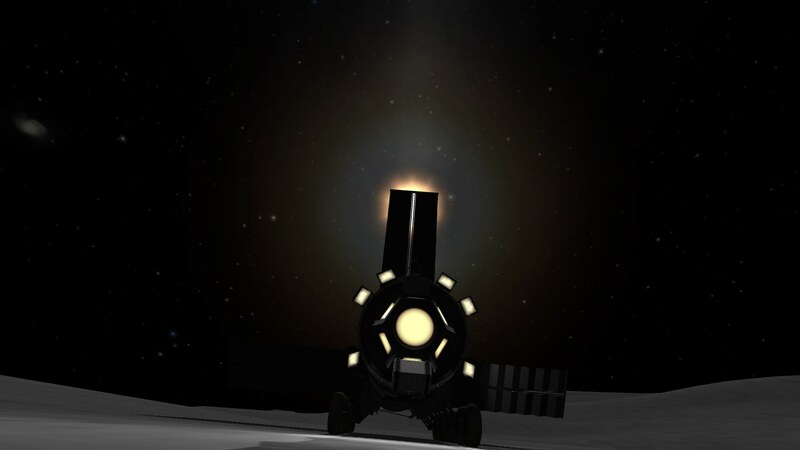 As I seem to be able to keep up to date with my Mission Reports, I've decided to make a "consolidated thread" to make it easier to find the latest post. This way you can click the links rather than scrolling through old "news". Reports - Science Mode Game. 1. A False Start. 2. A New Beginning..... 3. 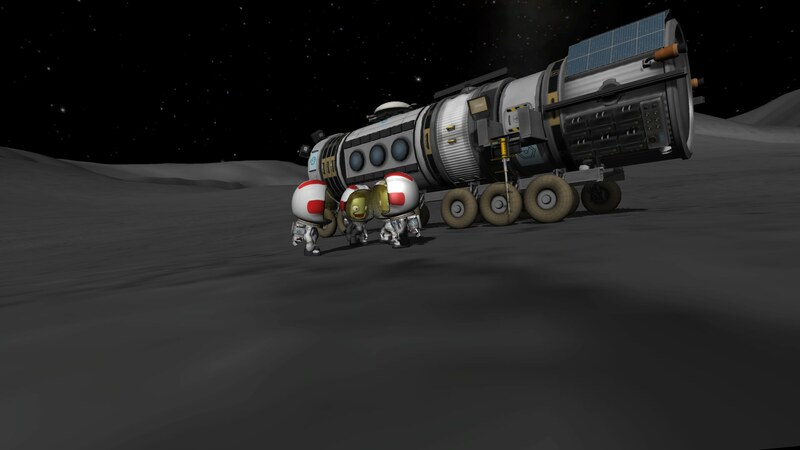 Testing the Large Mun Rover 4. 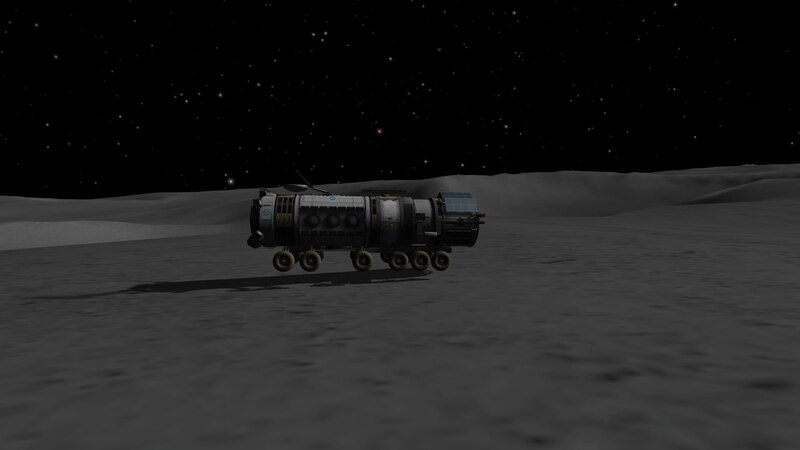 Destination Mun - Transporting the LMR. 5. LMR - Report One 6. 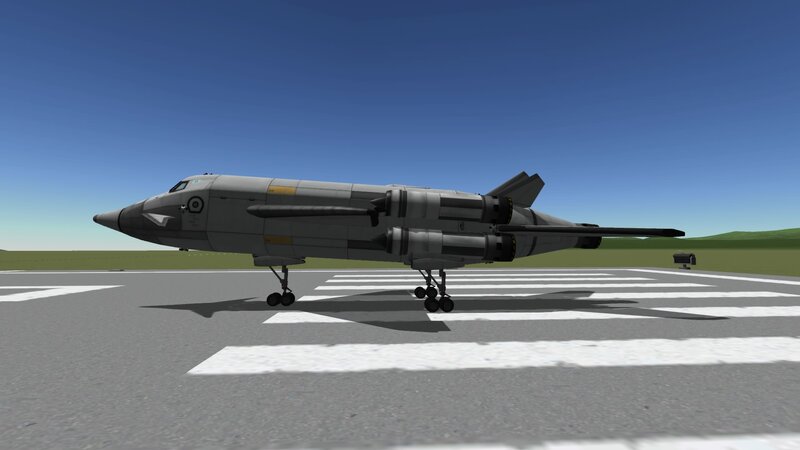 The A1 MK3 SSTO. 7. 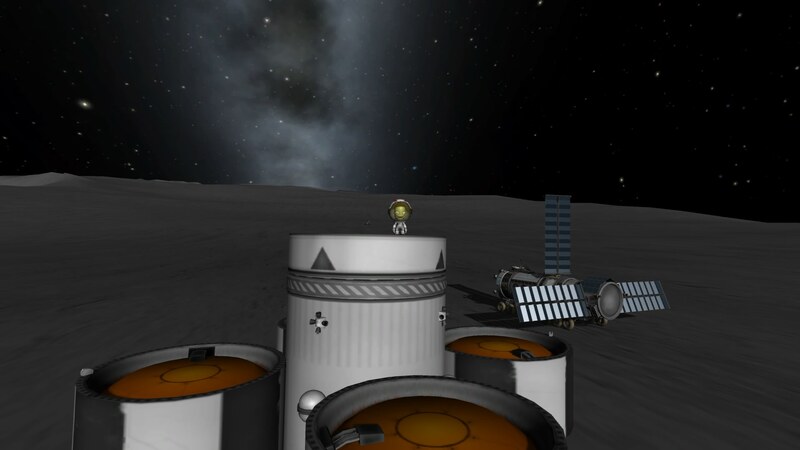 Minmus & Mun Reports (including LMR - Report Two) 8. LMR - Report Three 9. LMR - Report Four (running Westwards) 10. LMR - Report Five, A1 MK3 News and thoughts on Career Mode. 2. News - Going Global & Interlude - Making one story out of two. 3. A Quick Update - Why no new posts? Large Mun Rover (LMR) - Report No. 1. Scientists - Mitman & Gillie. After a somewhat hair raising landing, I'm glad to say the LMR was deployed without incident and the minor damage was soon repaired. We carried out the mandatory 2km test drive, again without problems, before we were given the go ahead to venture further afield. We initially headed East, towards the giant East Farside Crater complex, in the hope of taking measurements and samples. Navigating on the Mun is hampered by the closeness of the horizon and the need to keep such a large Rover on fairly forgiving ground. We wound our way both North and South, avoiding the secondary craters, formed by the debris thrown up during the formation of East Farside. At one point, we were even forced to travel back, due West for a time. We occasionally sent up our drone (ok, zoomed out, but back to the story...) to get a wider view of the route we had planned, but quickly became bogged down. The LMR seemed to have difficulty maintaining a steady speed up even fairly modest slopes. So much so that we had to resort to using the "Twitch" Engines at one point. This caused some real concern as, before the mission, it was thought the "Twitch" Engines would only be needed in extreme circumstances. With strictly limited amounts of fuel & oxidiser available for the entire mission we made an unplanned stop [3° 13' 39" N : 165° 34' 44" W : Elevation 4802m] to make some adjustments to the Drive Limiter, Friction Control & Brake wheel settings. These made a huge difference and we continued towards East Farside. The further we travelled towards the crater rim, the rougher the ground became. Travelling towards the sunset was also starting to become an issue. Scouting out the area ahead, it became obvious that we would not be able to descend into the crater from this position. We are currently camped at "West Point", at a straight line distance of 31.4km from our landing site. The further we travelled towards the crater rim, the rougher the ground became. Congrats on getting as far as you have. Mun is absolutely my least-favorite place to sight-see. it's got a bit too much gravity to be a good place to hop around with reasonably small rockets, and considerably too rough to be easy to drive on. Cheers. Although, please don't think this is the end for the LMR! The visit to Farside was only ever intended as an aside to the main mission, which is to drive as far West as I can be bothered to, before turning North and heading for the Polar Biome. Sometimes they might sit a while at one location, but I'll keep returning to them until they call for the return vehicle and end the mission. 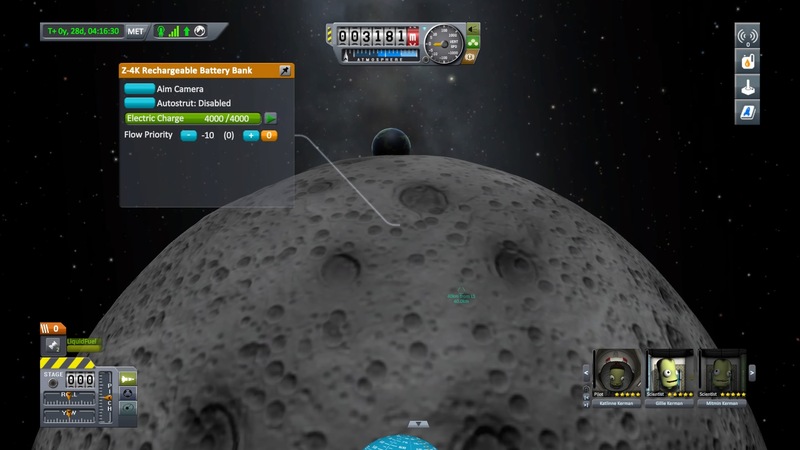 I actually quite enjoy driving on the Mun. Having a larger rover helps with the low gravity and having to plan a route to avoid the steepest slopes is part of the challenge for me. SSTO News. Prototype Flies High. Having been granted unlimited funding, the space program continues to develop in different directions. Here we see the newly built A1 MK3 Prototype as it readies for take off. Few details have been confirmed so far, however we do know there have been three successful test flights, with two achieving orbit and runway return in a single orbit. The named is rumoured to be inspired by an ease in finding the relevant file quickly, in a growing manifest of vehicles. 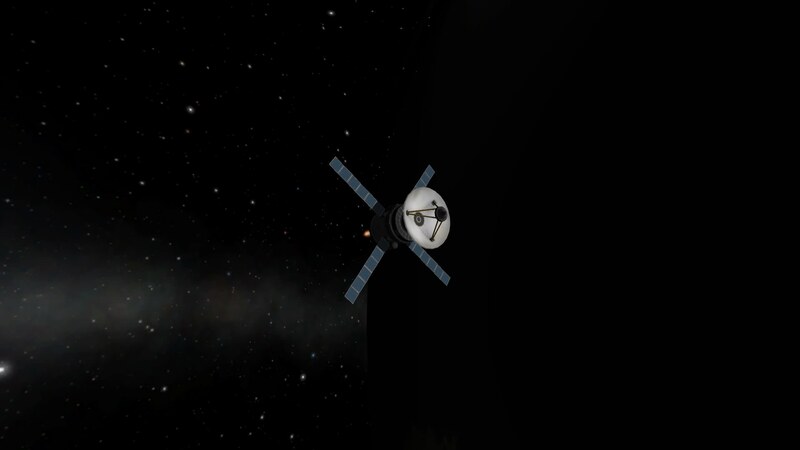 As the SSTO program was tasked with the lofty goal to "Take something that does something" into LKO, we see a hastily constructed small Deep Space Probe. 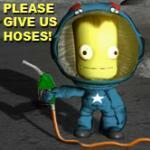 A series of these will be launched on escape trajectories from Kerbin to "...see what happens.". It is also thought that a variant of the A1 MK3 will, one day, carry crews to and from interplanetary craft in LKO. We shall bring you more on this story in a special tomorrow evening. 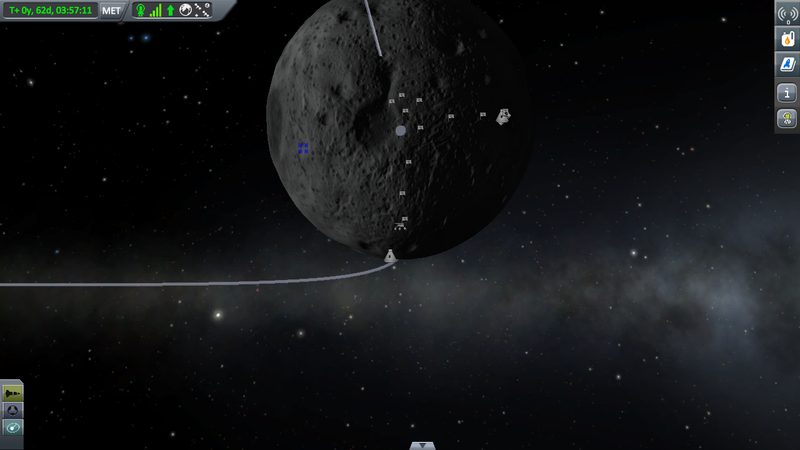 I actually quite enjoy driving on the Mun. 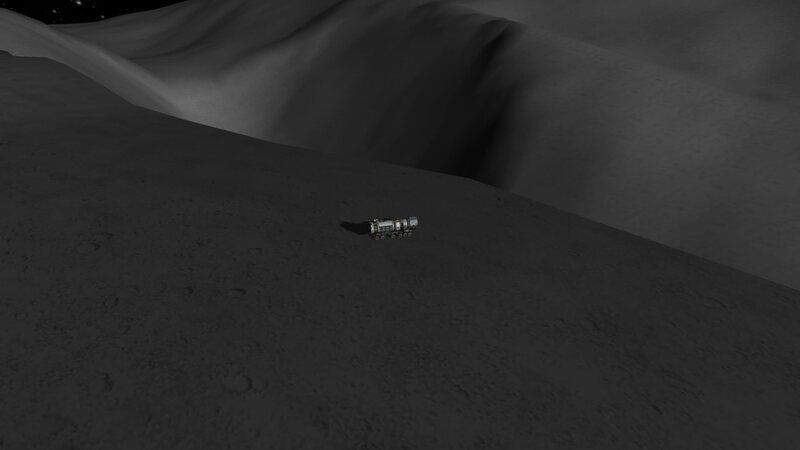 When I 1st started KSP in 0.20, procedural terrain hadn't yet been applied to Mun (or nearly anything else). So it was all vast triangular planes at slight angles to each other except for a couple of big, handmade craters and the odd mountain (all of which were just smaller, steeper triangles). All smaller details were just drawn on the texture. IOW, excellent rover country. You could really put the hammer down when going in most directions, only having to slow down every 20-30km when you came to an equally long ridge where 2 big triangles met. Must be nice Nice Mk3 SSTO, too. Hehe - I find it strangely relaxing. Here's a map of my previous (PC) attempt. Each flag in the arc from lander to lander (the rover is close to the Southern lander) is 40km apart. That's straight line distance, not accounting for the actual route. I would have gone back and done more if I still played on PC. Although, I found it impossible to travel any further South due to the steepness of the slopes. The final slope they tackled was a little over 45° and it was an exercise is avoiding damage rather than actual driving! I prefer building space planes from the MK 2 pieces as I like the look of them better. The drag issues are a pitty and the reason behind the current prototype. Next step is to extend the cargo hold or replace it with passenger accommodation. 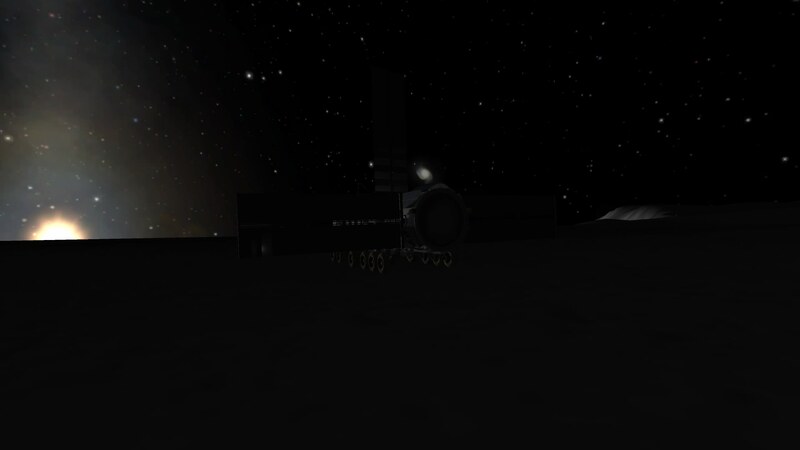 As well as another successful launch of a Deep Space Probe from the SSTO A1 MK3, we have two reports this evening - One from each of our moons. We remained at West Point to eat dinner, play a few rounds of "Who's Kerbals Hat?" and make a start on the vintage Port. Unfortunately, we paused a little too long on the Cheese course and by the time we were ready to move off, we found ourselves in darkness. The sun was just visible over the next ridge, so we drove as quickly as we dare up a nearby slope, to recharge the batteries and make ready for the long Munar night. With attention on the ground about to turn to the upcoming Minmus mission, we may get the go ahead for a prolonged, 20+ day, stay at this location. Research and Development is in constant demand of new data to help in their work and they lobbied hard for one last GL flight to Minmus. 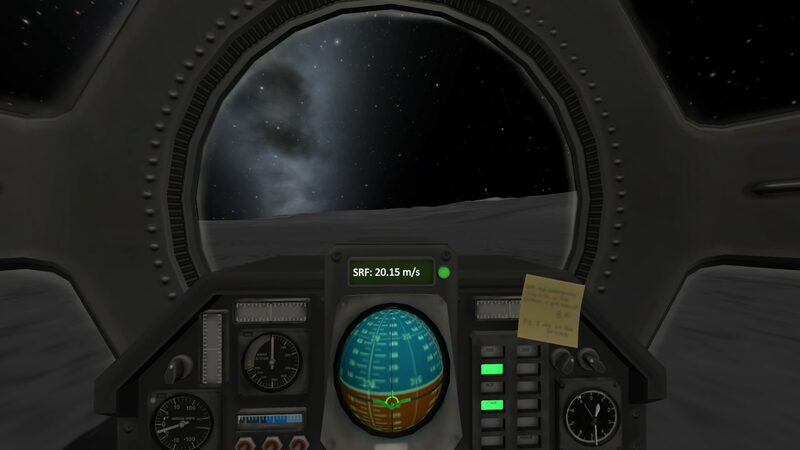 After the R&D department called "Rock" to the Space Plane supporters "Scissors", the arrangements were made and the next launch was towards the Minmus Highlands. The first landing was a little short of the target, but did return valuable science from the Slopes biome. A short hop up the hillside gave a second set of results, this time from the Highlands themselves. An uneventful trip home with around 1,000 science points seemed to satisfy the R&D crowd for a while. After another long Munar night at our prolonged stay location, it was so nice to see the sun rise again. We paused for a couple of hours to enjoy breakfast and allow the sun to rise high enough to illuminate our route, before setting off in a generally Westwards direction. 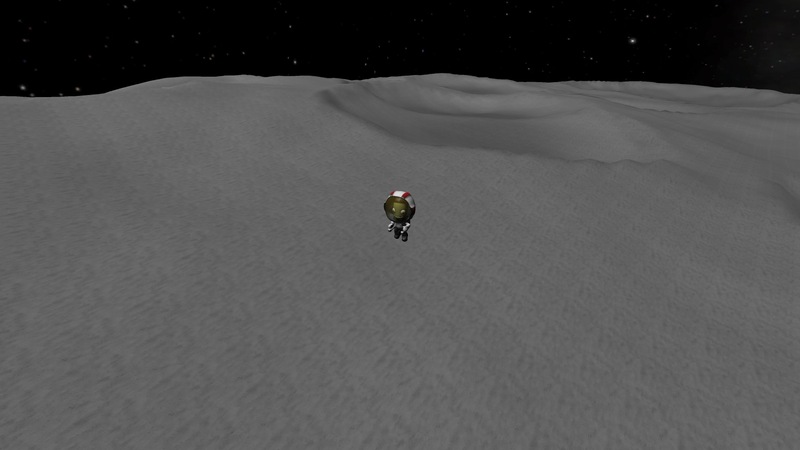 Due to the number of large craters in the area, we are forced to head back towards the original Landing Site. There doesn't seem to be any opportunity to head out in a different direction until we are almost back at our start point. As a safety measure, we travel with the large solar panels retracted, which requires us to pause every so often to recharge the batteries. Although they were only half way depleted, we stopped to take in the view and check for alternate routes at a point 18km from West Point and 13.7km from the landing site. As there were no engineering tasks to attend to, I took the opportunity to jetpack across to the crater rim and take some pictures. Distances here are still hard to judge and I was surprised it was actually just over 1km away. It looked so much closer! The return trip burnt 3.9 units of fuel. On returning "home", I checked the Rovers tanks and the propellant level is currently : LF 674 : Ox 824. Valtrude checks out the descent stage. We finally made it back to the landing site, paused to examine the remains of the landing stages (plenty of propellant on them, but we have no way to syphon it off) and pushed on for another 4½km in as Westerly direction as the ground would allow. Here we set up camp for our rest period and will continue later in the Muns day. The LMR against the sun. Mission Motto - "Why? Because someone has to!" Distance from Landmarks 40.2km from L.S. : 71.3km from West Point. 1. Katlinnes view from the driving seat of the LMR. We continue ever further Westwards and as is evident from our position, we have crossed the meridian from West to East. 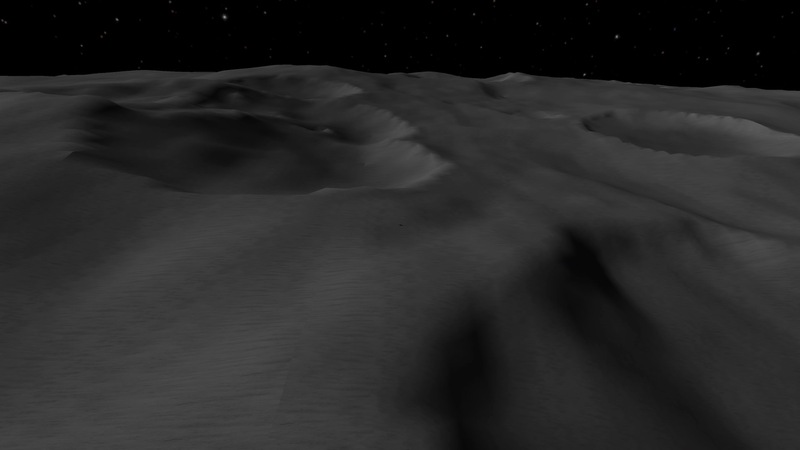 The surroundings remain largely unchanged, although the gaps between craters are now a little wider and so we can keep a fairly true course for once. Katlinne has, for the most part, kept the speed around 10 m/s - 15 m/s, with a top speed so far, of just over 20 m/s. 2. Bouncing along, "riding" the landscape like a dusty wave! The going can be bumpy and we had one very near miss. A change in the camber of the ground brought us down, hard on the Port side. Thankfully the EVA Front Step hit the ground first and a quick application of right roll saved the day. We have been making use of KerbNet to to get an idea of the area around the LMR. It hasn't proved to be that helpful! We have decided that we will keep heading 270° until we see our home planet rise above the horizon. Why? Because someone has to! 3. We spent some time trying to stand on top of each others head, sadly we didn't do it. We have been making use of KerbNet to to get an idea of the area around the LMR. It hasn't proved to be that helpful! That has always been my experience with KerbNet, too. Regardless, this is becoming an epic trip. I wish you every success. The only times I've used it were on the (underpowered) laptop. With the cockpit dials too blurry to read, no shadow or lighting effects, vertical landing was a real challenge. At least KerbNet tells you the elevation of the ground below. Now, with clearer graphics on the PS4, I can use the radar altimeter and go back outside for the final 100m. Cheers! I'm getting quite a kick out of the futility of the mission! . It kills a bit of time, so I can get the Science from the 3 labs to unlock the last tech node I want before fast forwarding to the next Duna window, for a Kerbaled mission to Duna and probes to the outer planets. By then the console patch should hopefully be available, so I can start again with a career game. 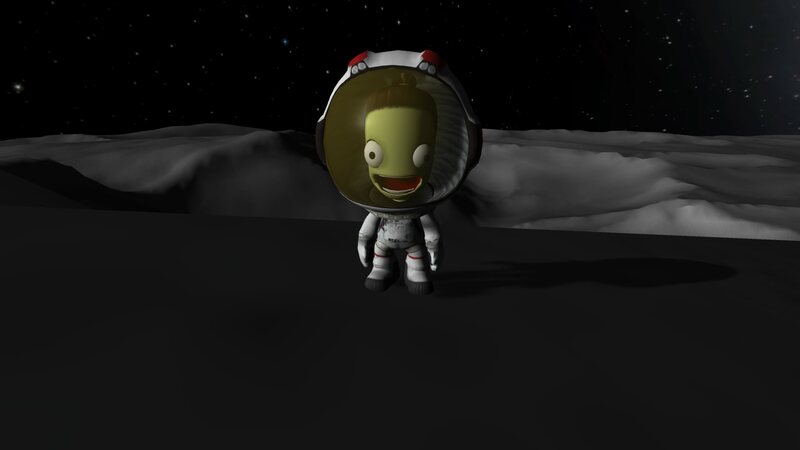 Gotta love KSP!! Fig 1. Katlinne uses her jetpack to scout out the route. Onwards we roll, ever Westwards, save for the excursions around the larger crater chains. The sun, now almost directly overhead, beats down relentlessly, messing with our sleep cycles. I think we all starting to feel the pressure of being couped up together with so little spare room. I have it luckier than the others. As the only engineer I have this rear section of the Rover to myself. I can still sometimes hear Mitman snore though! We are due to receive a resupply drop soon. Hopefully some letters from home will lift everyone's spirits. Fig 2. The LMR is just visible as a small black dot towards the center of the image. Fig 3. Selecting a part allows us to see where the Rover is at this long range. 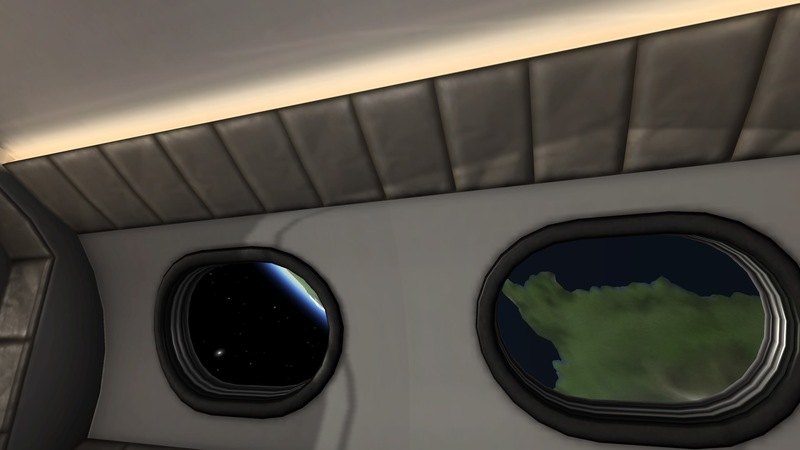 As research onboard the Minmus Orbital Lab begins to wind down, Mission Control has been considering the best method of returning the crew. Quite a few variations of the A1 MK3 Space Plane have been test flown to see what kind of range they might have beyond LKO. It was eventually decided that it would be a dashed sight easier to simply build a rocket to do the job! However, one piece of additional equipment passed its first set of tests. The A1 MK3 is, naturally, based around the MK3 "shuttle" parts. There's a shielded docking port attached to the front node of the cockpit, but that can make docking with smaller targets a bit trickier. 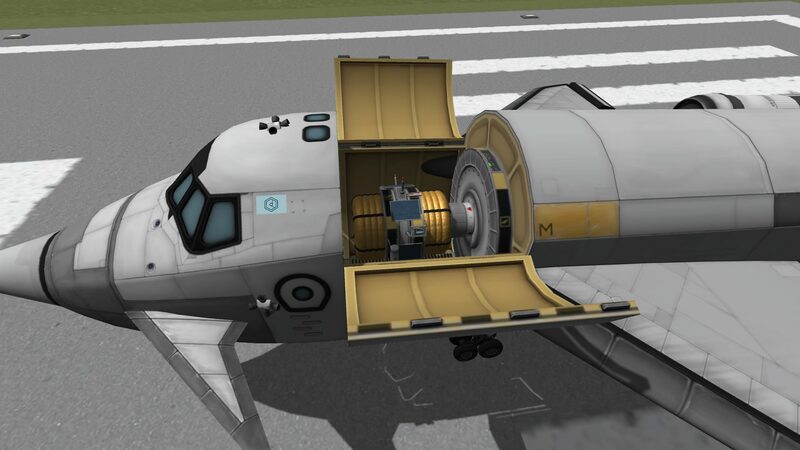 Carried up in the cargo hold, a simple structural fuselage based "extender" with a docking port at each end was flown out and round to the front of the ship, before docking successfully. 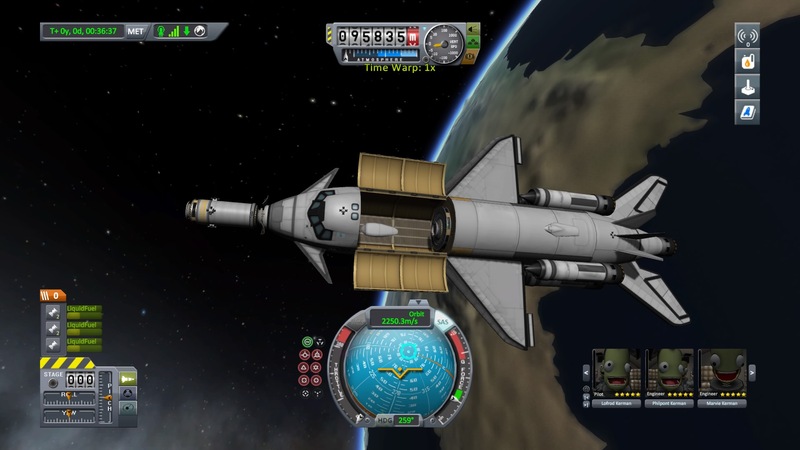 Fig 4 The A1 MK3 SSTO after deploying the docking adapter. Feeling a little unsure of what to do next, the lure of a new Career Mode game became too much to resist! I'm not sure how buggy the post patch Enhanced Edition career mode game is, hopefully any remaining issues will have been addressed before I get to the interplanetary phase, which is where I've heard bugs lurk. Career Mode - PS4 - Settings. 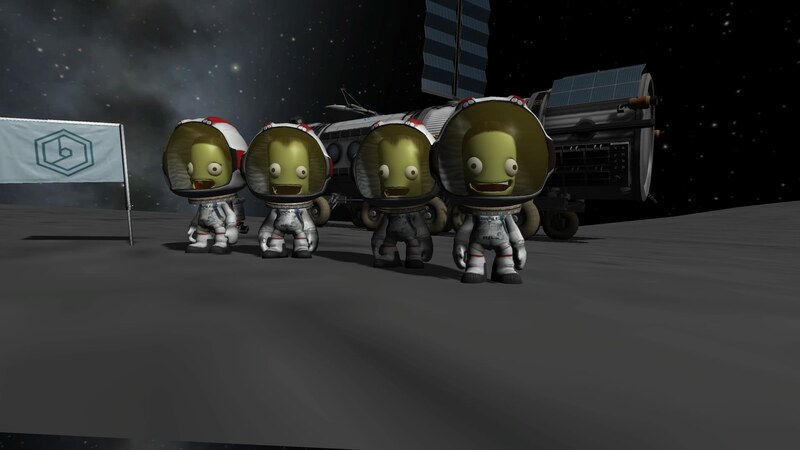 So far Jeb and Val have earned 1xp each, flying various sub-orbital science gathering missions. The project has been funded by offering a real life test environment to private industry. Heat shields, engines, decouplers and parachutes have all been subjected to vigorous tests which have (mostly) gone well. We have had a slight hick-up with one parachute test, with the demanded speed and altitude parameters proving an ill match with our current flight profiles! We are travelling much to fast between 10,000m - 6,000m and so we may end up building a bespoke vehicle to complete the contract. We have all the technology needed for our maiden orbital flight, which we will launch as soon as it's mission control turn to use the TV. Should that mission prove successful, we hope to move into the lucrative tourist market. For anyone who might be interested, I've included the settings I'm using below. I've enabled pressure and G limits on parts. Added G loads effect Kerbals. Added Plasma Blackout and the signal requirements when controlling a probe. Allowed Action Groups from the start. Kept the multiple communication ground stations. I don't have that much experience with career mode, so I'm not sure how I'll fair. The Space Centre has been a hive of activity over the past few days. 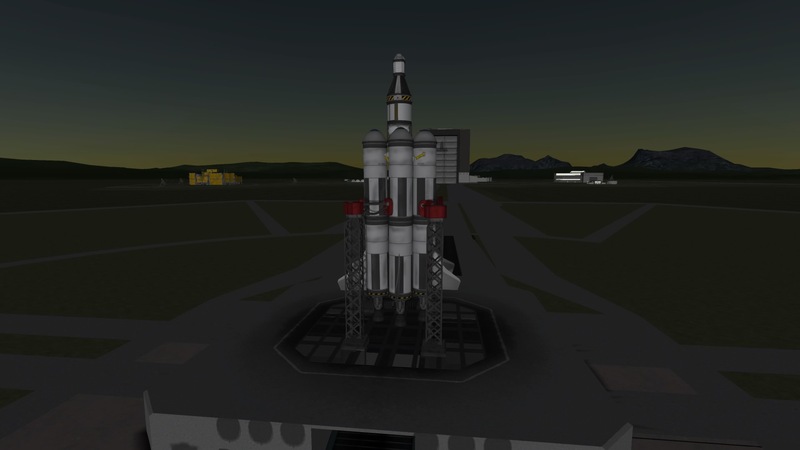 After Val became the first Kerbal to complete an orbit of our planet, her historic vehicle was quickly adapted into a passenger carrying variant. Val's descent from orbit also proved the ideal time to test the main 'chute under the conditions required by the manufacturer. Four passenger flights have already circled Kerbin, each one landing a little closer to KSC than the last, as we refine the timing of the retroburn. Fig 1. Passenger Rocket on the pad. The money generated has gone back into the Space Centre, with building work on the VAB, Launch Pad and Mission Control already completed. Bob took a quick trip round the Centre in a "concept" rover based around the MK1 capsule, a Terrier engine (on loan from manufacturers for comprehensive testing), landing wheels and a full suite of science equipment. He took in a number of locations around the Centre with the science data transformed into new technology by the R&D department. Fig 2. The view from the passenger cabin. 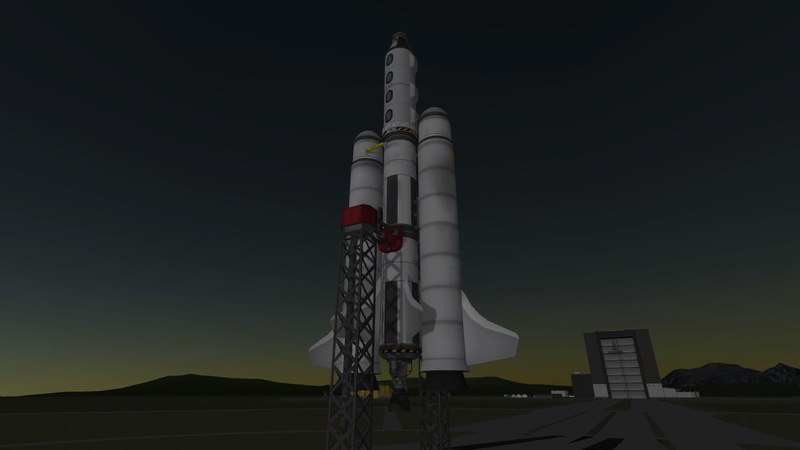 With fuel pipes now available, it was time to recreate an old favourite amongst lifting vehicles. Stack two FL-T800 tanks on top of each other and add a LV-T 45 "Swivel" engine. Add three pairs of Radial Decouplers and on each pair of decouplers place another stacked pair of FL-T800 tanks, this time with a LV-T 30 "Reliant" engine on the bottom. Paying close attention to the order in which these radial stages decouple, run fuel lines from the first pair that will drop to the second, from the second to the third and from the third into the central core stage. This "asparagus" staging provides enough Delta V to allow a Mun Fly-by. This will be our next Science mission. All data will be transferred to an Experiment Container for return with the crewed capsule. Fig 3. The asparagus staging ready to launch. Interlude - In which some background is explained. With the success and massive budget available to the original space program, it eventually came under the spotlight when the Ruling Kerbal Family were looking to make spending cuts. It was reasoned that private industry could provide enough income to run a space program without spending tax-roots. Unfortunately, almost all of the advanced equipment the Space Complex had been using was on loan from various universities. Once this had been returned it was apparent that quite a lot of funding would have to go into the infrastructure, in order to return to its former glory. With a name change to the Kerbal Space Centre (in association with Big Bob's Bacon Burger) everyone was ready for a new beginning. I thought I should provide a quick update for those who have been kind enough to read these reports. You may have noticed that they haven't been updated in a while? Reason 1. Is, rather annoyingly, down to a bit of a health problem that laid me rather low for a while. Things seem to be getting back onto an even keel now, but it did cut into my gaming time! Reason 2. There is one problem playing the console version of the game, especially when you have a family. I have to wait until the rest of the household has retired for the evening, before I can take control of the living room TV. In the mean time, the gaming time I have been giving the brain a rest and playing a little GTA Online with an old friend. But rest assured that I shall be back soon to resume the saga!